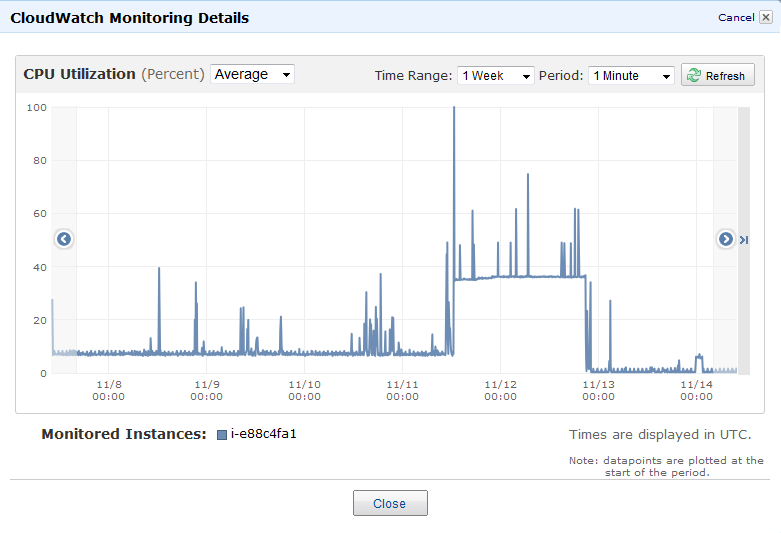 my bitnami moodle has been running stable for a few weeks now on an amazon t1.micro instance. After trying to use moodle with a big class (27 users) the mysql-db crashed. That happened before, but a server restart fixed everything. Not this time. 111113 13:10:33 mysqld_safe Logging to '/opt/bitnami/mysql/data/mysqld.log'. 111111 12:42:40 [Note] Plugin 'FEDERATED' is disabled. 111111 12:42:40  InnoDB: Database was not shut down normally! 111111 12:42:42 [Note] /opt/bitnami/mysql/bin/mysqld.bin: ready for connections. 111112 20:56:43 [Note] Plugin 'FEDERATED' is disabled. 111112 20:56:43  InnoDB: Database was not shut down normally! 111112 20:56:44 [ERROR] Do you already have another mysqld server running on port: 3306 ? 111112 21:16:50 [Note] Plugin 'FEDERATED' is disabled. 111112 21:16:50 [ERROR] Do you already have another mysqld server running on port: 3306 ? 111112 21:35:52 [Note] Plugin 'FEDERATED' is disabled. 111112 21:46:01 [Note] Plugin 'FEDERATED' is disabled. 111112 21:46:01 [ERROR] Do you already have another mysqld server running on port: 3306 ? 111112 22:05:04 [Note] Plugin 'FEDERATED' is disabled. 111112 22:05:04 [ERROR] Do you already have another mysqld server running on port: 3306 ? 111113  2:54:31 [Note] Plugin 'FEDERATED' is disabled. 111113  2:54:32 [ERROR] Do you already have another mysqld server running on port: 3306 ? 111113 13:10:33 [Note] Plugin 'FEDERATED' is disabled. 111113 13:10:33 [ERROR] Do you already have another mysqld server running on port: 3306 ? Could you check if there is another mysql process running? The value in the second column is the PID? I´m pretty much a linux beginner. Killing the first process (the second one seems to be not existent) didn´t help. I still cant launch mysql via the ./ctlscript. root@:/opt/bitnami# 111113 19:46:12 mysqld_safe Logging to '/opt/bitnami/mysql/data/mysqld.log'. could you post the latest lines that you can find in the mysql log file? I´m in class right now and can´t access the server via SSH from here. But I looked through the Amazon-Server-System-Log and found some sql-entries, maybe these will help. As soon as I´m back home I will post the last lines of the mysql-Logfile. landscape-client is not configured, please run landscape-config. 111104 13:54:09 mysqld_safe Logging to '/opt/bitnami/mysql/data/mysqld.log'. 111112 20:56:43 mysqld_safe Logging to '/opt/bitnami/mysql/data/mysqld.log'. 111113 19:46:12 [Note] Plugin 'FEDERATED' is disabled. 111113 19:46:12 [ERROR] Do you already have another mysqld server running on port: 3306 ? Did you install any software in the machine? I´m getting this error every time I restart the whole server. I installed two moodle-plugins a few weeks ago, but moodle ran without problems all the time. The problems started after the mysql-crash when a big class tried to login to my moodle. Any other ideas? I´m willing to do more drastic things (reinstall mysql?) to get moodle working again. Made big changes to a course and don´t have a backup. With "start a new instance of the same BitNami Moodle AMI" You mean via "Instance Actions" and "Launch more like this" in the AWS-interface? Or another fresh install with an Bitnami Amazon Machine Image? I mean to start a new one, a fresh installation to migrate your data. Alright, after a lot of pain I got my data back. Started a fresh new instance, copied the /opt/bitnami/mysql/data from my old server, changed permissions. Result: Still database-error when trying to start moodle, but the mysql-server was running. Tried to fix the mysql-db, failed. Tried to make a db-backup via phpmyadmin, failed. Nailed down table "mdl_log" as the trouble-maker (backup canceled there). Made a new backup without that table, working. Made another fresh instance, copied the backup, finally working. Now I have proper backups for the next db-crash. Trying to find the cause now.